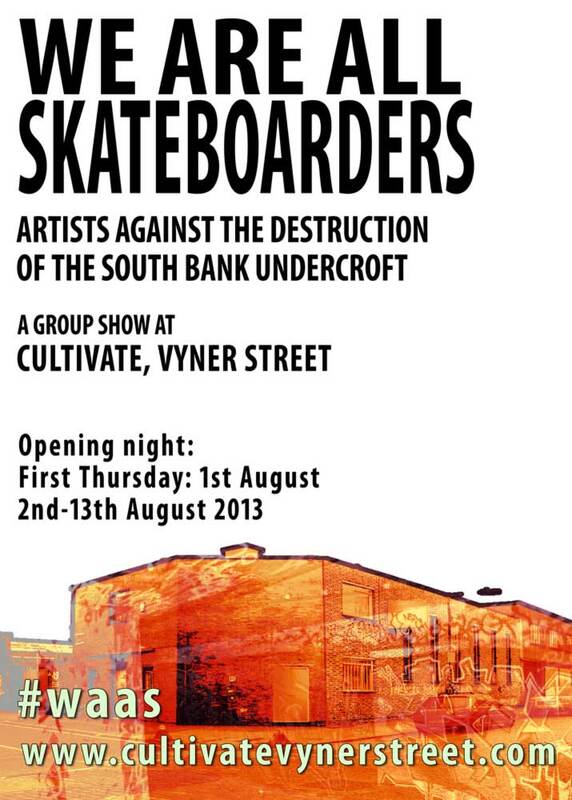 Back in August we held a two-week show at Cultivate called WE ARE ALL SKATEBOARDERS. The reasons why we put on the show were well documented here at the time. 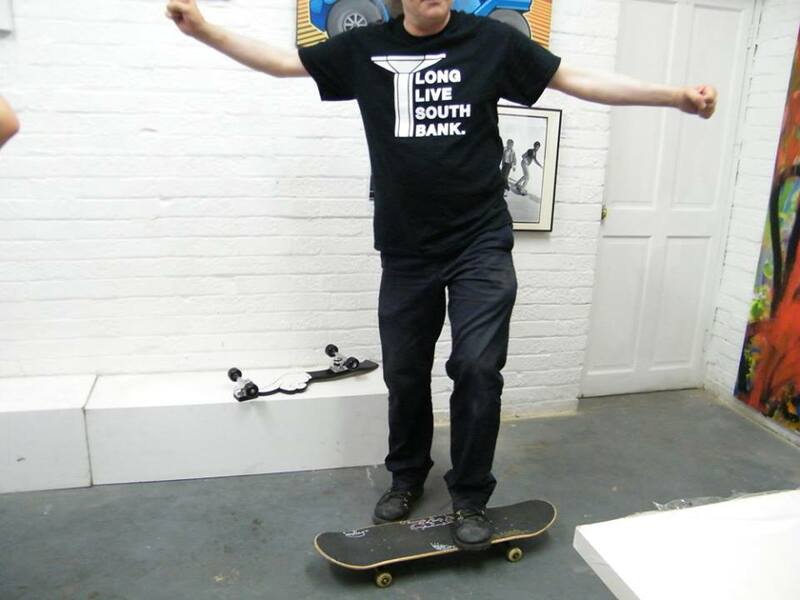 The board of the heavily publicly funded London Southbank Centre,.with their very twisted (and frankly outrageously dishonest) PR spin, were divisively claiming the skateboard community, who have called the Southbank Undercroft their home for around 40 years, were in someway obstructing artistic and cultural endeavor. The Southbank’s divide and rule tactics were demanding we, as artists stand with them and stand against the skateboard community. We as artists, painters, gallery people were far from happy about this – they made us choose, it wasn’t a difficult choice, we as artists chose to vocally declare that in this case, we are all skateboarders. 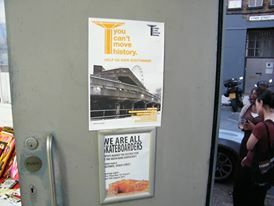 Of course it isn’t as black and white as the Southbank board would like everyone to think, it isn’t just about skateboarding, the Undercroft space is important to everyone – to visitors, to Londoners, to tourists, to artists, to the graffiti and street art communities, to the people going to the Tate, to anyone with an interest in contemporary culture. The place is vital in so man y ways, vital in terms or art, in terms of creatvity, inspiration, vital to hip-hop culture, to those who like things to evolve in a spontaneous nature – this has all been documented already both here and in thousands of other places by people from all walks of life. I have not heard a single voice in favour of taking away the front line creative space that is the undercroft and replacing it with yet more retail opotunities (well besides those on the Southbank payroll like Billy Bragg). We’ve had hundreds, of conversations with people young and old, with artists, music fans, skateboarders, painters, photographers, people who just like walking along the Southbank and stopping to look at the art and the activity, to enjoy a place that is always alive and always inviting, not one person has disagreed with the LLSB campaign. 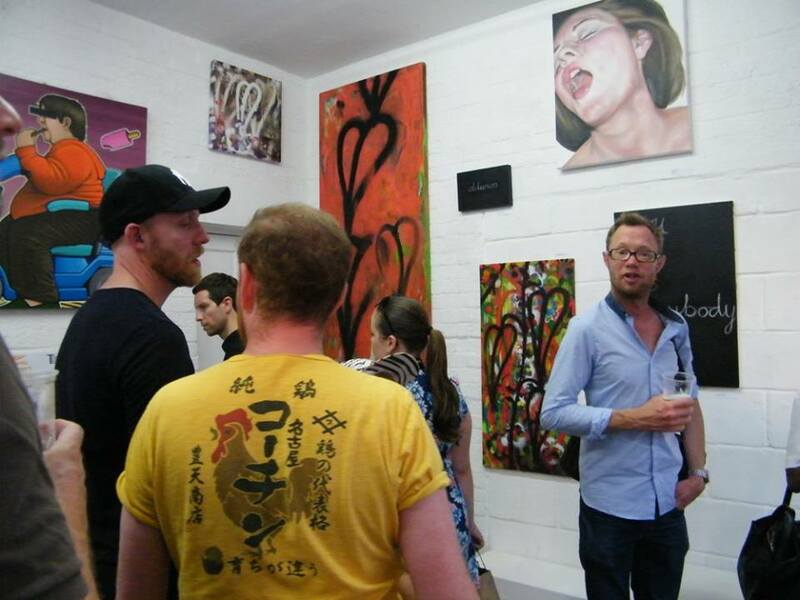 The behaviour of the Southbank board is a disgrace, as a working artist and gallery owner they embarrass me, they disgust me…. the Skateboard area is everything the Southbank centre should be about, it should be celebrated, not shoved out of the way in favour of a profit margin and another damn coffee shop. .
We bring all this up again today because the LLSB campaigners have just released this film, and because this campaign and our objections to what the Southbank board are doing must continue to be voiced… Watch the film…. “Long Live Southbank presents our educational campaign film showing the 40 year history of one of London’s most unique cultural spots, the 9 month campaign to protect it, and the true story of its intended destruction by the Southbank Centre. London’s skateboard community and our supporters have campaigned every single day for the preservation of Southbank (Undercroft) since the Festival Wing plans were first revealed. The result was unprecedented public support – from all walks of life Something the Southbank Centre has failed to achieve. Our support continues to grow daily. This is not about denying the expansion of access to culture, this is about the questioning of the integrity of archaic hands that seek to stifle and silence culture. We are the voice of young people who stand for the future of artistic and cultural expression in an ever-changing world, for everyone. Not on paper, but in practice. ← WHAT HAPPENS TO THE CULTIVATE SPACE NEXT? AN ART CHUTE? AN ART SHOOT?